We have a new status map showing the situation with KAIRA. This is available from the Status page, which can be found in the title bar of this web log. The map shows the array layout of the antennas. The High-Band Antenna (HBA) tiles are in the top left and the Low-Band Antenna (LBA) aerials are in the lower right. The layout is to scale, which is shown, and the direction to the VHF transmitter at Tromsø, is also indicated. The antennas are numbered and they are also colour coded to show the Receiver Unit (RCU) mode. 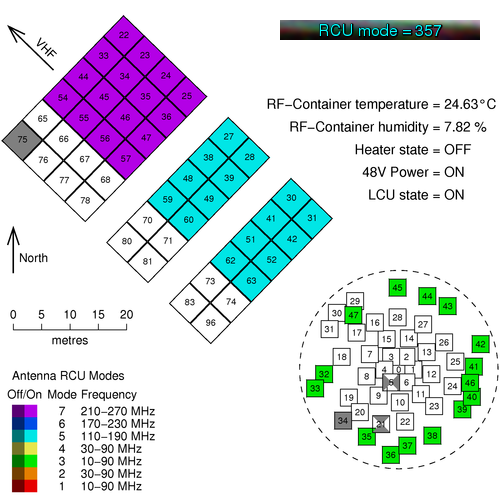 KAIRA has 96 RCUs and the RCU mode indicates which combination of antenna plus band-pass filter is used for the processing. 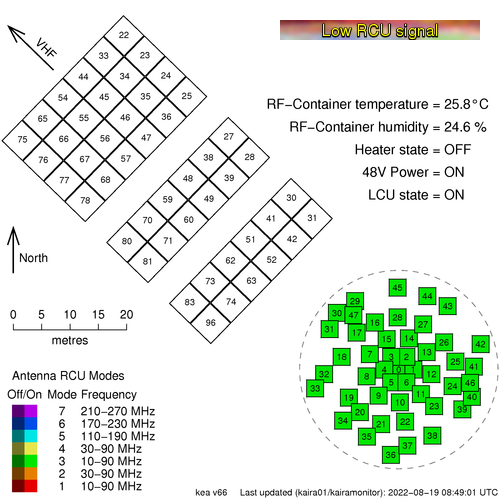 Sometimes the entire array is configured to a single RCU mode and at other times it is mixed with several different modes for different antennas. If an antenna is enabled, then the colour is bright, but if it is switched off, then it is dulled down. In the case of a plain grey antenna icon, this means the antenna is shut down, either for maintenance, or as a result of damage. Sometimes an antenna might be shaded with two colours like a two-tone maritime-Z-pennant. This is because each antenna has two polarisations, and there will be occasions when the RCU number/status for each polarisation is not the same. In the bottom left, there is the legend and in the top right is the status label and the current RF-container parameters. are those knocked out by the March 2014 blizzard. are also present in this particular example.